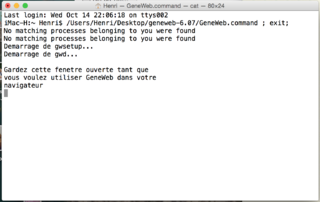 Traces in terminal window at GeneWeb start. Download the appropriate version. The latest stable version available is geneweb-6.07.tgz. Double-clicking on the downloaded .tgz file creates a subfolder /geneweb-6.07. Move this folder where you prefer. 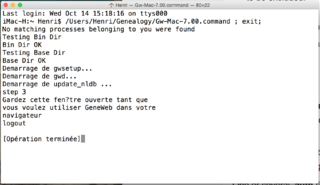 Start GeneWeb by double-clicking the GeneWeb.command (not gwd or gwsetup).This should open a terminal window and browser window with the start page of GeneWeb. If the terminal windows just opened indicated "failure", this may be due to some idiosyncrasies of your environment. and save the result back to disk. 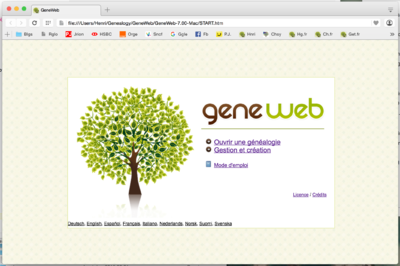 Start GeneWeb by double-clicking the new GeneWeb.command. When GeneWeb is running on a machine, it behave like a web server and will accept URLs following a precise syntax. You can lauch GeneWeb with a lot of parameters, for example as a Unix daemon or behind a real HTTP server with CGI. Installing multiple versions of GeneWeb is possible. 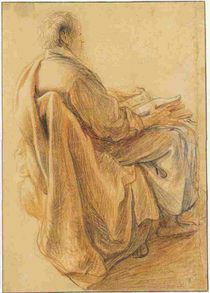 The following section describes one approach. One of its benefits is to make more explicit several aspects of the folder structure expected by GeneWeb. The first step is to organise a folder structure which will contain the various elements. Although style and taste may vary, here is a proposal for such a structure which is rather general, identifies the various components associated with GeneWeb and is amenable to changes. drwxr-xr-x   5 Henri  staff    170 14 oct 12:57 .
drwxr-xr-x+ 81 Henri  staff   2754 14 oct 13:28 ..
Folder structure under Mac OS X for GeneWeb (source code and binaries). In this organisation, the GeneWeb folder contains one or several GeneWeb distribution (detailed organisation of one distribution folder), and the GeneWeb-Bases folder contains one or several genealogy bases. This setup has the advantage of maintaining active at least two running versions of GeneWeb which may be handy for moving bases from one version to the other. The two folders gw-6.08-alpha-src and gw-7.00-Mac and file gwget-7-00.sh relate to GeneWeb sources and will be discussed in section #From sources. 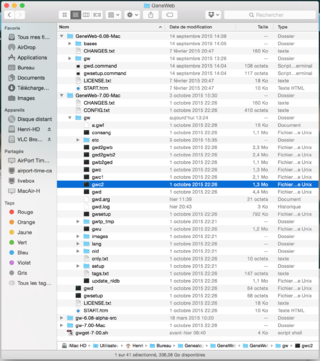 With this folder organisation, clicking on $HOME/Genealogy/Gw-Mac-7.00.command (download it here, you have to execute a chmod +x on this file to use it) will open a terminal window, kill previously running versions of gwd and gwsetup, start a fresh one and open the same start page as above. The folders gw-x.yy contain sources for version x.yy of GeneWeb. Executing the Makefile in this folder (after having Installed OCaml) will create a distribution folder containing all data necessary for execution of GeneWeb. Renaming this distribution folder to GeneWeb-x.yy-Mac and moving it into the GeneWeb folder discussed above brings us to a known situation. The file gwget-7-00.sh is a shell script that will fetch the latest version of GeneWeb (currently version 7.00) from the GitHub repository, compile it and move the resulting distribution folder appropriately. Of course, the structure above can be extended to more that two versions of GeneWeb, and to more than two bases. Appropriate editing of the shell scripts and command files may be necessary. This page was last modified on 25 November 2016, at 10:21.